Did you watch the Telemundotelenovela Al Otro Lado del Muro last night? If you did, then you must have been glued to your couch, just like me!! except unlike Sofia, I was not locked in there by my husband, The Governor. And unlike Sofia, my housekeeper did not bring me a delicious dinner with a hidden cell phone to use. And unlike Sofia, I did not get a visit from Paula, my husband’s mistress and campaign manager, who gave me permission to leave my room, so she could yell at me. And unlike Sofia, I am not a former beauty queen who my husband’s mistress choose to be The First Lady based upon a good head shot. And unlike Sofia, my husband’s mistress would not have me shot in the head if I don’t behave myself. Sofia had a TERRIBLE day yesterday, and she got absolutely no traction even though she busted wide open the Human Trafficking ring her husband and his friends run. When she confronted her husband, he denied everything, even though she found the secret papers in his safe that were basically receipts for selling teenage girls to the Cartel. He Plays The World’s Greatest Liar so perfectly that he could work for Trump as his new Press Secretary. Even though I had seen I the meeting between him and the Mob about the Human Trafficking, he almost had ME convinced he wasn’t involved. To add insult to injury, he sent the kids to his mother’s and locked Sofia in her room, which the entire household staff did not think was unusual at all. Then, Sofia got the bad news from Paula that not only is Paula The Governor’s First Girlfriend, but the Governor only married Sofia because she was popular, and because Paula picked her over the telenovela actress. The fact that Paula choose Sofia over a telenovela actress not only shows how brave Paula is, but was also DELICIOUS because all of the women in the show are Telenovela Actresses. I love Meta-Moments like that. Plus the show was so tense that I needed a little comic relief. The only bright spot in Sofia’s day were the violets the Interpol agent sent that had a cell-phone hidden inside, so he can help her escape. Plus, I predict it is his first courting gesture. 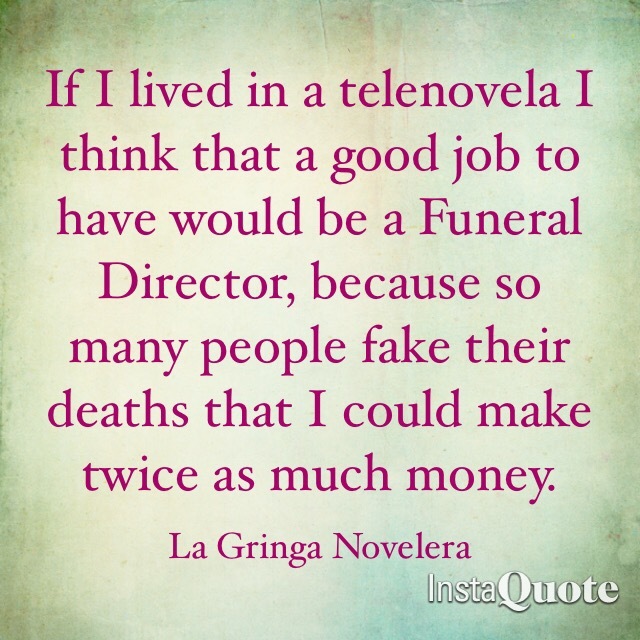 No one owes a bigger debt to telenovelas than the telephone industry. You know who betrayed Sofia?Julian, The Governor’s Mini-Me and Child Spy. No one says “Que haces Aqui” as scary as this kid. If I was Sofia, I’d get Julian a box of Tic Tacs to keep in his pocket, like Elaine gave to “The Sidler” in “Seinfeld,” so she always knew when he was coming. Eliza had a bad day too:Not only did she leave her mother AND the bakery, to take the kids to L.A. to live with their dad, but she also had a very hard time keeping her son out of her purse every time she wasn’t looking, which is a sure sign of a Bad Seed. Plus, she must be afraid to fly or something, because Max looks pretty successful and could have definitely afforded the three plane tickets. And their son’s impending illness. This novela is gripping and excellent, and you don’t want to miss it! !